The internet is still buzzing with excitement following Tuesday's episode of The Flash, 'Duet'. The musical crossover with Supergirl was highly anticipated and later praised by many, with fans enjoying the unique nature of the episode as well as the infectious songs. And now, fans can take those tunes home with them, thanks to the release of the official soundtrack from WaterTower Music. The record company, which is owned by The CW's partner Warner Bros., unveiled the soundtrack on iTunes late Tuesday night. The seven-song album contains all five of the tracks featured in the episode, including the cover versions of 'Moon River', 'Put a Little Love in Your Heart', and 'More I Cannot Wish'. But, as most fans of the episode will get excited about, the soundtrack includes the episode's two original songs; 'Super Friends', written by fellow The CW star Rachel Bloom, and 'Running Home to You', written by the award-winning La La Land writing duo of Benj Pasek and Justin Paul. The album even includes an alternate version of 'Running Home to You', in which Barry Allen (Grant Gustin) is accompanied by guitar. The album also includes Flash and Supergirl's composer Blake Neely's theme for the episode's villain, Music Meister (Darren Criss). As WaterTower's press release points out, this soundtrack is a must-have for fans of some of the stars' previous gigs, namely Gustin, Criss and Melissa Benoist's roles on Glee. "This musical episode and soundtrack is exciting not only for the Supergirl crossover, but also given Gustin and Benoist’s history starring in Glee. This episode pairs them with fellow Glee alum Darren Criss, who plays the villain The Music Meister in this episode. Criss also studied musical theater at the University of Michigan along with The Flash star Carlos Valdes." The soundtrack is available for purchase on both iTunes and Amazon Music. Be sure to check out our ranking of each of the soundtrack's songs. DARREN CRISS (“GLEE”) GUEST STARS AS THE MUSIC MEISTER IN THE FLASH AND SUPERGIRL MUSICAL CROSSOVER – Barry (Grant Gustin) and team are surprised when Mon-El (guest star Chris Wood) and Hank Henshaw (guest star David Harewood) arrive on their Earth carrying a comatose Supergirl (guest star Melissa Benoist) who was whammied by the Music Meister (guest star Darren Criss). Unable to wake her up, they turn to Team Flash to save her. However, the Music Meister surprises The Flash and puts him in a similar coma, one that Team Flash can’t cure. Kara and Barry wake up without their powers in an alternate reality where life is like a musical and the only way to escape is by following the script, complete with singing and dancing, to the end. Dermott Downs directed the episode with story by Greg Berlanti & Andrew Kreisberg and teleplay by Aaron Helbing & Todd Helbing. 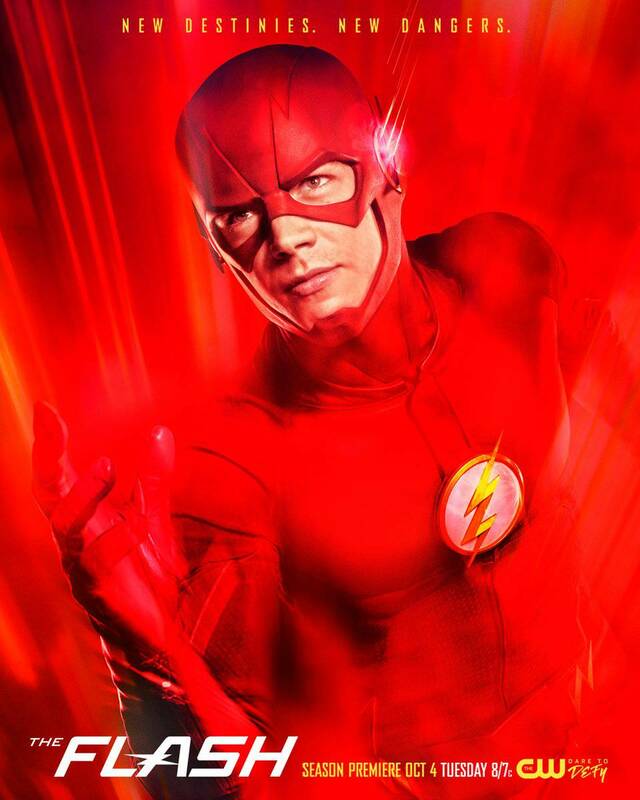 Based on the characters from DC, The Flash is from by Bonanza Productions Inc. in association with Berlanti Productions and Warner Bros. Television, with executive producers Greg Berlanti (Arrow, Supergirl), Andrew Kreisberg (Arrow, The Flash), Sarah Schechter (Arrow, DC’s Legends of Tomorrow) and Aaron and Todd Helbing. "Duet" episode of The Flash will air Tuesday, March 21 at 8 p.m. ET/PT.